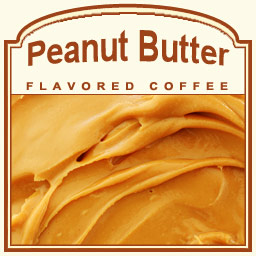 Peanut Butter flavored coffee is the ultimate flavored coffee for peanut butter lovers. You no longer have to add a dollop of peanut butter to your favorite coffee because FlavoredCoffee.com has done it for you. Made with 100% Arabica beans, this Peanut Butter coffee will feature a nutty, smooth taste that will accompany a full-bodied coffee flavor, meshing the best of both worlds: coffee and peanut butter. This rich concoction has only 2 calories in each cup, so give into the temptation and indulge as much as your peanut butter-loving taste buds can handle! Roasted, packaged, and shipped on the same day, this flavored coffee will offer a fresh roasted coffee and peanut butter taste. If you are looking for a rich Peanut Butter flavored coffee, it doesn't get any better than this! Shipped in a heat-sealed valve bag, your Peanut Butter flavored coffee will feature the freshest flavor possible. Go ahead, indulge in this peanut butter treat!